Clarification on the G Unit from Monthly Bushiroad, along with a support Grade 3! 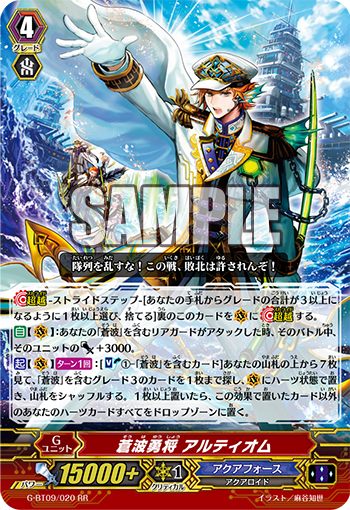 Auto (VC): When your Rear-guard with “Blue Wave” in its card name attacks, during that battle, this Unit gains Power+3000. Act (VC) 1/Turn: [Soul Blast 1 – card with “Blue Wave” in its card name] Look at the top 7 cards of your Deck, search for up to 1 Grade 3 card with “Blue Wave” in its card name, place it in (VC) as a Heart, then shuffle the Deck. If you place 1 or more card, place all of your Heart cards except the card placed by this effect. “Blue Wave Brave General, Artiom” is a Blue Wave Support G Unit. Its first ability, when your “Blue Wave” Rear-guard attacjs, lets the attacking Unit gain Power+3000! Which means whatever the Unit is, it should have more than enough Power to hit the Vanguard. It’s really good with Units that attack from the back row like “Blue Wave Dragon, Submerge Dragon”. And its second ability allows you to exchange your Heart. By looking at the top 7 cards of your Deck, you can search for 1 Grade 3 “Blue Wave”, and place it into the Vanguard Circle as a Heart! It’s good for placing a Grade 3 Unit with a Stride Bonus like “Blue Wave Dragon, Anger-boil Dragon” as your Heart! “Blue Wave Marine General, Jason” is a Unit with a Stride Bonus for “Blue Wave” only! If you meet the conditions, when a Battle against the Vanguard ends, a Rear-guard in the same column can exchange places! By exchanging locations to the back row after an attack, you can aim for continuous attacks… If you combine it with the previously introduced “Blue Wave Brave General, Artiom”, you’ll be able to launch consecutive attacks that raise your Power! Today’s “Weekly Vanguard News Bits NEXT”, will include a fight using cards from “Divine Dragon Caper” and “Ritual of Dragon Sorcery” which both go on sale later this week. Please pay attention to the new cards for 《Gear Chronicle》 and 《Shadow Paladin》!